This sheet of laser-cut Window and Door Assemblies provides a mix of five different assemblies - a nice selection for the scratch-builder or kit-basher. Each window assembly includes laser-cut pieces for the window pane(s) (sashes), headers, trim, and sills. Each door assembly includes laser-cut pieces for the door assembly, headers, trim, and sills. The modeler can use pieces to accommodate wood-framed windows or just the sashes for masonry wall windows. There is a mix of extra trim pieces to give the modeler a variety of pieces and parts. This item includes a sheet of acetate glazing that should be cut to size for each window. To install the windows into the wall opening, first install the glazed sashes into the wall opening; be sure to leave a gap along the bottom edge of the sash to accommodate the sill. Add the sill below the lower window sash - perpendicular to the wall. Add header, lower, and side trim pieces around the perimeter of the wall opening - overlapping the edge of the window sash and the wall opening. To install the doors into the wall opening, first laminate the front and rear layers together (if applicable) and install into the wall opening; be sure to leave a gap along the bottom edge of the door to accommodate the sill. Add the sill below the door - perpendicular to the wall. Add header and side trim pieces around the perimeter of the wall opening - flush with the edge of the door assembly. > Six (6) double hung 6-over-6 windows for a 3'-0" wide by 6'-0" high opening. > Four (4) double-wide, double hung 6-over-6 windows for a 6'-0" wide by 6'-0" high opening. 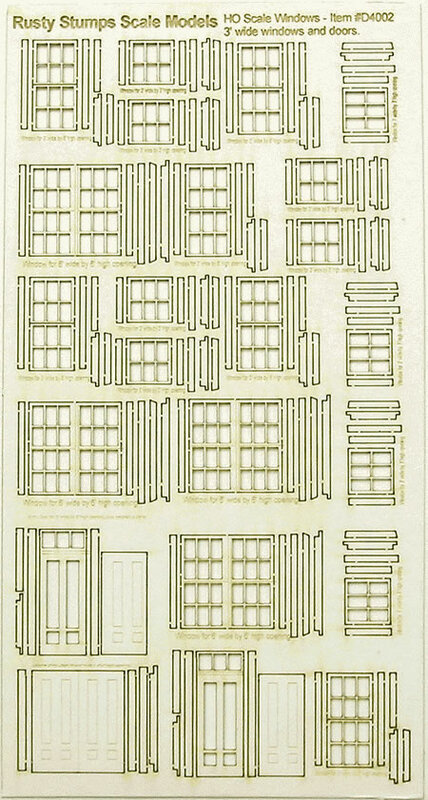 > Ten (10) single sash windows of various styles for a 3'-0" wide by 3'-0" high opening. > Two (2) single entry doors with transom lites for a 3'-0" wide by 8'-0" high opening. > One (1) double entry door for a 6'-0" wide by 6'-6" high opening. Double Hung Windows 6 3'-0" 6'-0" 0.4138" 0.8276"
Double-Wide, Double Hung Windows 4 6'-0" 6'-0" 0.8276" 0.8276"
Single Sash Windows 10 3'-0" 3'-0" 0.4138" 0.4138"
Single Entry Doors 2 3'-0" 8'-0" 0.4138" 1.1034"
Double Entry Doors 1 6'-0" 6'-6" 0.8621" 0.8966"
"Actual Sizes" noted above are approximate - use the actual items to accurately mark wall openings. NOTE ON MATERIALS: This laser-cut sheet is available on either CARDSTOCK or RCBOARD. See the MATERIALS page for information on these options.